Est: 1983 with an area of 98,000m2 and an average depth of 4 to 10m. 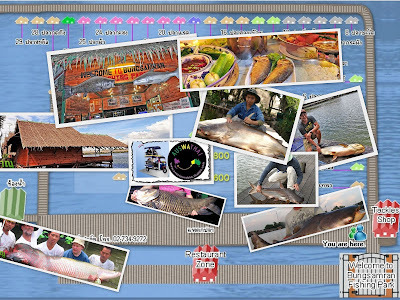 More than 50 kinds of both carnivorous and herbivorous game fish, including Giant Catfish, Giant Carp, Striped Catfish and Giant Snake head. The Park includes onsite Bungalows, Restaurant. The focus is "fishing" not aesthetics, the longer you stay the more you’re converted. Evenings are stunning at the open Restaurant; watch staff deliver food on wheels (push bikes).